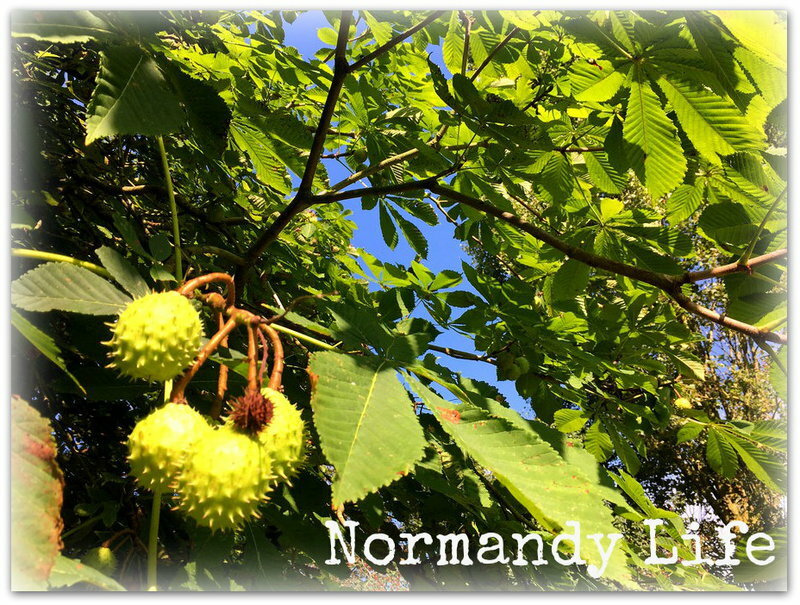 Normandy Life: A Transformative Year of Delight and Discovery. A Transformative Year of Delight and Discovery. 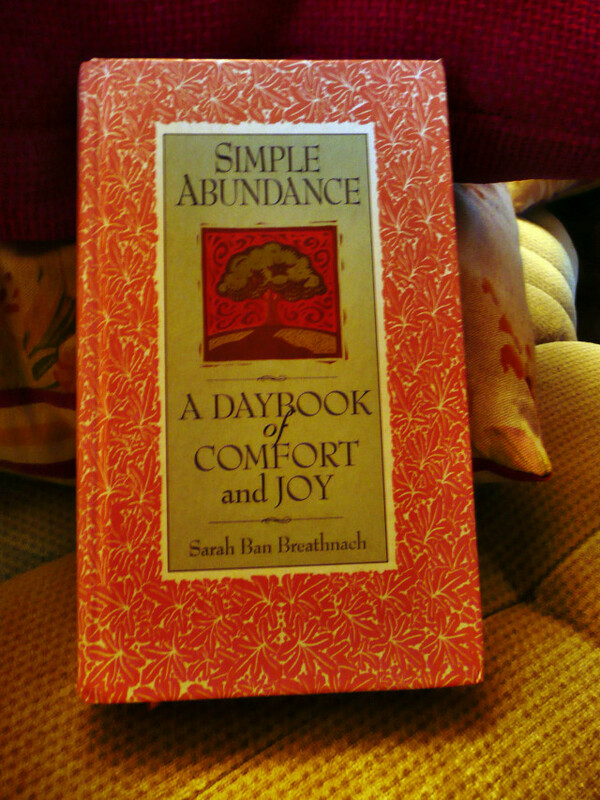 Sarah Ban Breathnach wrote the book "Simple Abundance" in 1995 and a copy of it has been on my bedside table for over six years now. Some of you reading this post may possibly have a copy, I've personally gifted it to several friends over the years. If you would like to visit SBB's Simple Abundance website there is a link on my sidebar. For the first couple of years I read a page every single day, in the following years I dipped into it now and then when I felt the need of some support. For some reason I have a feeling that 2012 is going to be a year of change for the Senior Partner and I, there's talk of moving back to the UK maybe this year maybe next, and our planned visit to Hilton Head, SC. in October could well be our last. As I said there's a feeling that this year may be different, we shall see! So, I'm turning to Simple Abundance once again on the first day of January, a month full of new beginnings, so that I can be reminded that "the authentic self is the Soul made visible", I feel sure it will help me to face the challenges as they come up. 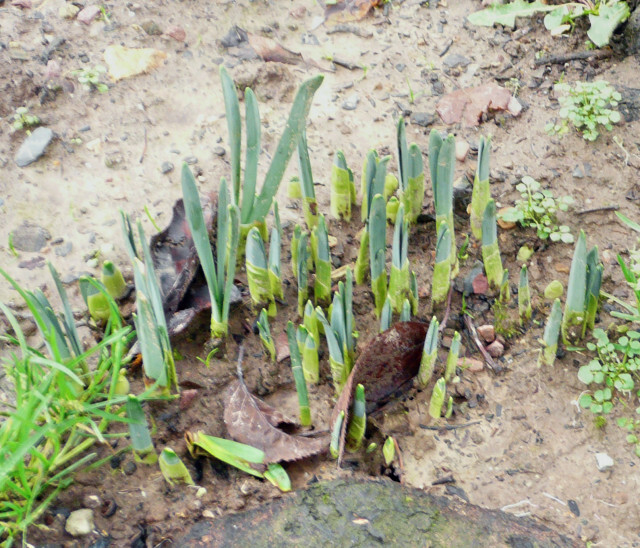 Some who commented on my last post were surprised to see daffodils in our garden at Christmas/NewYear. 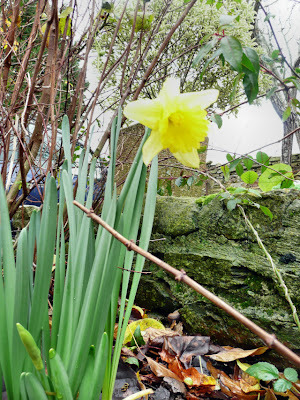 and there seems to be at least one impatient daffodil appearing somewhere in the garden every day. 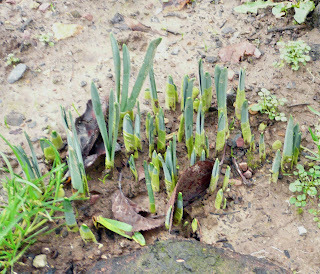 Sheila @ Starshine Through My Windows saw her first snow fall in November and is, like many others, only imagining daffodils on New Year's Day. Her comment has prompted me to take a daily daffodil photograph in order to share a little bit more of Normandy Life with my blogging friends. Joining The Tablescaper, with this first post of 2012, for Seasonal Sundays. Happy New Year to you, too! 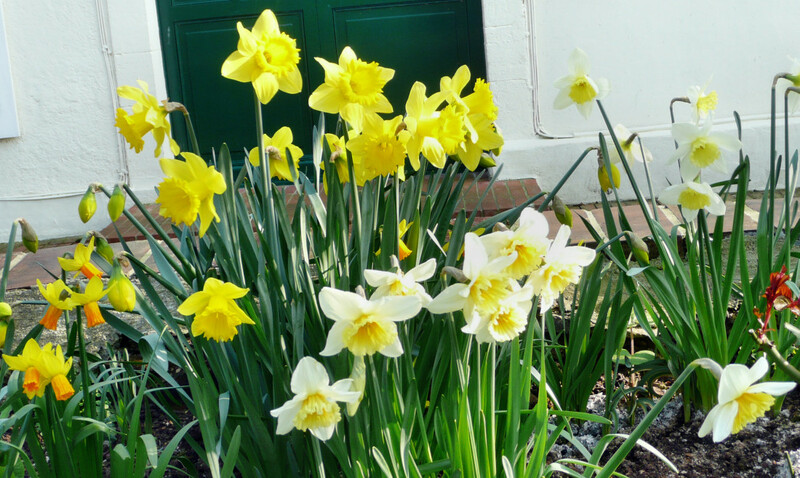 Love the daff picture -- no noses peeking up on the prairie -- that's not until a couple of months! Hi Maggie, will I be meeting you in the UK if you move back here this year!! !I hope between you you will make the right decision at the right time and I hope the book does help you.Good luck. We had some forsythia in flower in October / November time but it didn't last long and the bush is now bare of any signs of Spring. Happy New Year to you both, Jackie & Phil in Surrey. all doesn't it? I wish you luck and a very Happy New Year - whatever it brings to you. Have a copy of this book....I, too, refer to it often. It is a great life guide when one needs a little push. I have seen that book at the library and now will for sure check it out next time. I love that type of reading that keeps me on track. Thanks for reviewing it. Happy New Year! I think, Maggie, we all have sense of impending change for 2012. We hope that it is a change for the good. I had birthday before Christmas--a big one, so I have decided to indulge my inner child this year. Happy New Year to you and the Senior. May your year be cheerful and joyful. Maggie, you just made me go to the bookshelf and find my copy of Simple Abundance to start reading again this year. I know that this year is going to be new beginnings for me too. It needs to be re-read after 12 years on the bookshelf. I hope your trips to Herefordshire have planted the seed of you considering coming back to the UK. Daffodils flower wonderfully in the county. Happy New Year! I read Simple Abundance years ago and kept a list of the monthly to-do's in my calendar for awhile. It's a restorative book indeed. Happy New Year Maggie and thank you for you sweet comments. I am quite intrigued by your blog and by you mention of simple abundance. Thank you so much for commenting so I could take notice and perhaps gain the push that I too seem to need. Following you now too! Hello Maggie. Changes are in the wind, it seems, in many quarters. I hope that your plans come together just perfectly for you and the Senior Partner. I've not read Simple Abundance but have heard much about it. Perhaps this is the year I should read it! Whatever the New Year brings, I hope you will be able to embrace it comfortably. Change is hard. Happy 2012, here's to Life in Normandy! I can't believe I almost missed this post! Your news of the possibility of moving home is a big surprise - I'm certain you will be giving it a lot of serious thought. Also, I'm upset that I may miss you again in Oct. as we will be away. I used to dream of moving home - finding a little Devon thatch, growing all the cottage garden flowers I can't get here, walking the pebble beaches on a blustery day, and hiking over Dartmoor - all memories of my youth! Of course it's doubtful this will ever come to pass now - but I still dream which is good because it gives one purpose in life as the golden years fly by far too fast! Anyway dear Maggie - if your plans are to be dreams fulfilled I say go for it. There really is 'no place like home' is there?